Build Muscle. Get Lean. Full Body Workout. | Free Trial! What is kga strength & conditioning? Sculpt long lean muscles and overall strength with our full body strength and conditioning classes. All major muscles groups are activated benefiting your strength, muscle tone, fitness and bodies composition. Classes are suitable for men and women of all fitness levels. Why Join KGA STRENGTH & CONDITIONING? KGA Strength & Conditioning classes are designed on the fundamentals of gymnastic strength & conditioning training. They are perfect for those interested in increasing their core strength, while focusing on mobility and bringing their fitness regime to the next level. A 20 minute high intensity “Flexibility Workout” followed by strength and conditioning workout that incorporates a variety of core engagement training. Through specific strength and mobility exercises we strengthen the muscles that improve overall mechanics and mobility required for performance of other sporting activities. I started to take more interest in stretching 2 years ago and also wondered how the ballerinas and gymnasts are so strong and mobile to be able to get into needle scales, backbends, etc. Finally when KGA introduced adult stretching classes, I thought it will be a good opportunity for me to learn how to stretch effectively and safely. Weekly classes with Coach Anton has been good and am starting to see some improvement in strength. WANT TO TRY A strength CLASS? GET A FREE TRIAL PASS! Q. What is Strength and Conditioning? KGA Strength & Conditioning is simply a great way to improve your body by losing body fat and defining muscle at the same time – without spending hours plodding away on a cross trainer. Strength & Conditioning is about maximum return for your input in a short period of time, with a structured approach to training. Q. Is this class too advanced for someone who does not work out often? We have years of experience in training those who want to improve and maximize their overall fitness from absolute beginners to advanced high level athletes. We cater the classes and exercises to your ability and as you get fitter and stronger the exercises get harder so you are always pushing yourself but ensuring you are avoiding injury. Q. Do you use heavy weights? No. 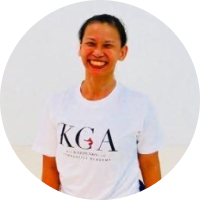 KGA strength and conditioning classes are based on gymnastic fundamentals and body weight movements that have been proven to develop strength, power and stamina.